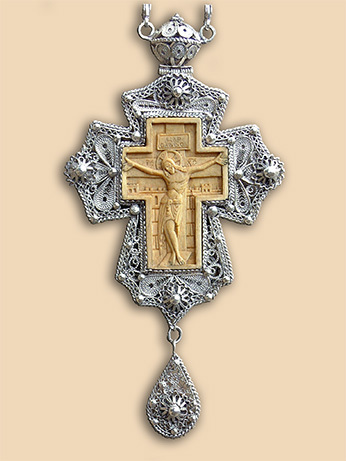 Pectoral cross in silver filigree with miniature carved Crucifixion on box-wood of Jesus Christ. Technique: filigree, granulation, woodcarving (Father Arandjel Danilovic, Gornji Milanovac). 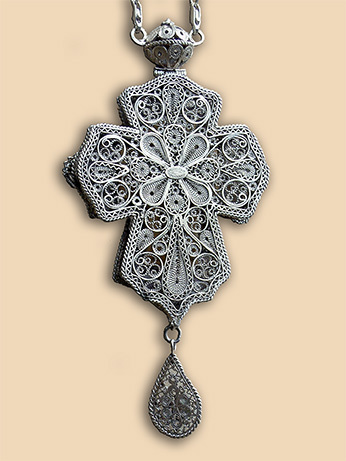 Size: cross 8.5 (14.5) cm×7,5 cm, chain 120 cm. Weight: cross 70 grams, chain 66 grams. Commissioned by: Priesthood of St. Trinity Cathedral in Kraljevo. In possession of : Protopresbyter-staurophor Miroljub Marinkovic, Kraljevo.